The regional operator Rhein-Neckar-Verkehr GmbH (RNV) is redefining e-mobility for public transport services of the future. During the “PRIMOVE Mannheim” research project, electric buses will recharge wirelessly while passengers get on and off the vehicles at bus stops along the inner city route 63. The project will prove that electric buses can operate daily passenger services, even on demanding routes. Germany’s Federal Ministry of Transport, Building and Urban Development announced that it will fund the project with 3.3 million euro. Secretary of State Rainer Bomba presented the grant for this innovative project to Christian Specht, Mayor of Mannheim and head of the city’s department of public transport, and Martin in der Beek, Technical Director, RNV. They accepted the funding on behalf of the four project partners RNV, the City of Mannheim, Bombardier Transportation and the Karlsruhe Institute of Technology. During an initial period of 12 months, two completely electrically powered and inductively charged electric buses will be trialled in daily passenger operation on the existing RNV bus route. Both e-buses, built by the Swiss manufacturer Carrosserie HESS AG, are also equipped with the new BOMBARDIER MITRAC e-bus powertrain for city buses. In addition, an electric van equipped with wireless PRIMOVE technology will be tested as a RNV service vehicle. The project will help to determine a framework for infrastructure, batteries, inductive energy transfer and daily operation by testing the new technology on a real-life route. The project partners aim to prove that a technology transfer towards e-mobility is viable. They will also gain insights into further improving low-emission public transport systems by focusing on the operating efficiency of daily transport services. Martin in der Beek emphasised RNV’s dedication to implementing innovative transport solutions: “We aim to expand public transport’s competitive edge in efficiency by putting the technology of inductively charged electric buses through its paces on a demanding city route and thereby proving its suitability for everyday use.” RNV GmbH was the first transport operator to use energy storage systems on its rail network; since 2009, light rail vehicles equipped with the MITRAC Energy Saver are operating successfully in the region. 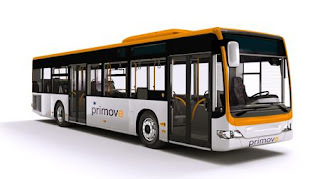 The use of PRIMOVE technology widens RNV’s commitment to efficient e-mobility to roads as well. The project partners will initially test the PRIMOVE technology during a testing and approval phase to collect information for the subsequent scheduled passenger operations, as well as for RNV’s internal operations and its training of personnel. Innovative features of the project include the planned optimisation of the charging process by evaluating real-time data on the vehicle’s position on the route and its battery’s level of charging. The Karlsruhe Institute of Technology’s department for vehicle systems technology will provide the project with scientific support under the direction of Prof. Dr.-Ing. Peter Gratzfeld. The research will focus on an energy simulation that demonstrates the entire power flow in the electric buses and at the inductive charging stations. This will allow the battery size and the charging infrastructure to be perfectly adapted to each other and determine the demands on the power supply network. The institute’s work will also confirm the greater energy efficiency of the system compared to conventional propulsion methods. An extensive measurement programme will verify the results of the simulations when the electric vehicles enter passenger service.